What is Black tea? All tea leaves are green when harvested. Some are processed green. Those used for black tea are left to oxidize or fermentate. Oxidation and so called firing turn the tea leaf black. During firing leaves are kept over fire (for example Lapasang Souchong tea from Mount Wuyi in Chinese Fujian province is kept of over burning pine wood which gives that tea a very special aroma) or in owens. Black tea makes over ninety percent of all tea sold in the western world. Black tea can keep its flavour for a long time. This fact contributed to the fact that black tea, compressed in brick shaped object, was regarded as sort of currency in the 19th century Mongolia, Siberia and Tibet. During Chinese Tang Dynasty (618-907 AD) black tea was used as cloth dye substance for people who could not afford clothing colours of that time. Let's return to the word black tea...In western world it is called that way because of the colour of its leaves. On the other side in China and related Asian cultures it is called red tea (Mandarin Chinese hóngchá, Japanese kocha, Korean hongcha) because of red colour of tea liquid. Black tea is often mixed with other plants. Hsiang Pian tea is in many Chinese restaurants served with a small amount of dried jasmine flowers. Pu-erh or Pu'er tea of Chinese Yunan province is sometimes mixed with rose buds or white chrysanthemums. 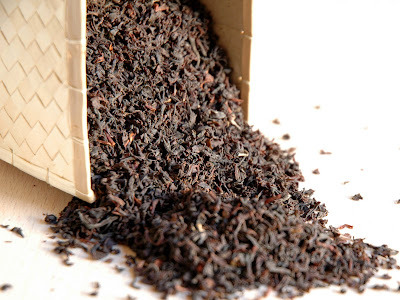 In the United Kingdom and Commonwealth countries black tea is usually consumed with milk.